Fewer Americans lack health insurance — but the gap remains wide, especially in some pro-Trump states. The number of uninsured declined to 28.3 million in the first quarter, down from 29.3 last year — and 48.6 million in 2010, the year the Affordable Care Act was signed into law by then-President Barack Obama, according to data from the federal Centers for Disease Control and Prevention. The distribution, however, is uneven with data for south central states — Arkansas, Louisiana, Oklahoma and Texas — showing almost a quarter of adults lacking health care coverage. President Donald Trump, who has opposed Obamacare, won those four states in the 2016 presidential election. Even with the reduction, one in eight Americans between 18 to 64 remained uninsured. Of those with insurance, about one in five were covered by public plans and seven in ten were covered by private plans. Children fared better, with more than 95 percent covered by public or private plans. About one in four Hispanics lacked coverage while 14.1 percent of non-Hispanic blacks, 8.9 percent of non-Hispanic whites and 6.1 percent of non-Hispanic Asians lacked coverage. The number of people under age 65 covered under the Health Insurance Marketplace declined by about 1 million to 9.7 million. 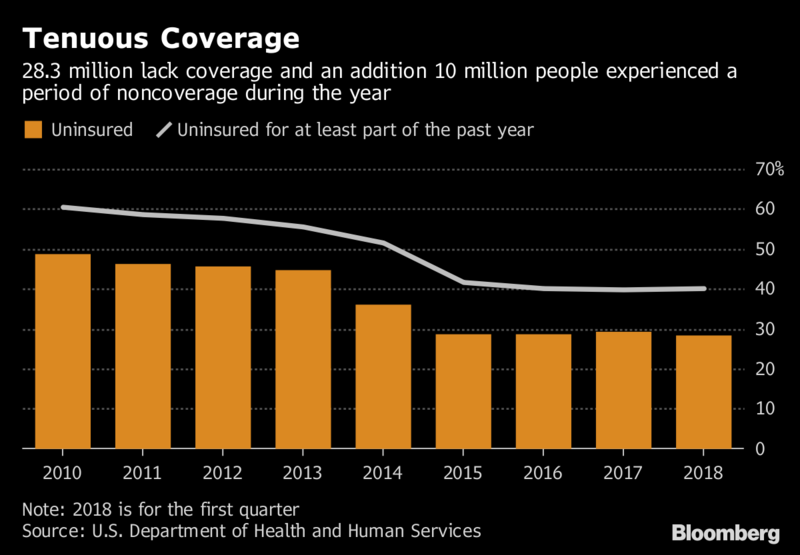 The number of adults who lacked health insurance for more than one year declined from 32 million in 2010 to 14.9 million in the first quarter of this year.